(CBS/AP) BEIRUT - Bashar Assad attended the swearing-in of his new defense minister Thursday, according to footage shown on Syrian state TV, the first sign of the president since an audacious rebel attack the day before struck at the heart of his regime and killed three senior officials. Government forces struck back against rebels with attack helicopters and shelling in a fifth straight day of clashes in Damascus. The inability of the military to control the clashes in the capital against lightly armed rebel forces and the deadly bombing of a high-level security meeting a day earlier made Assad's hold on power look increasingly tenuous. Speculation is rampant as to Assad's whereabouts, CBS News correspondent Clarissa Ward reported on "CBS This Morning" Thursday. Some opposition members said left Damascus for the heartland of his Alawite tribe in the coastal city of Latakia, Ward reports. That claim seems unlikely, however, given that Assad's security apparatus is in Damascus and a move to Latakia would appear as the president conceding his capital and backing away from the fight. 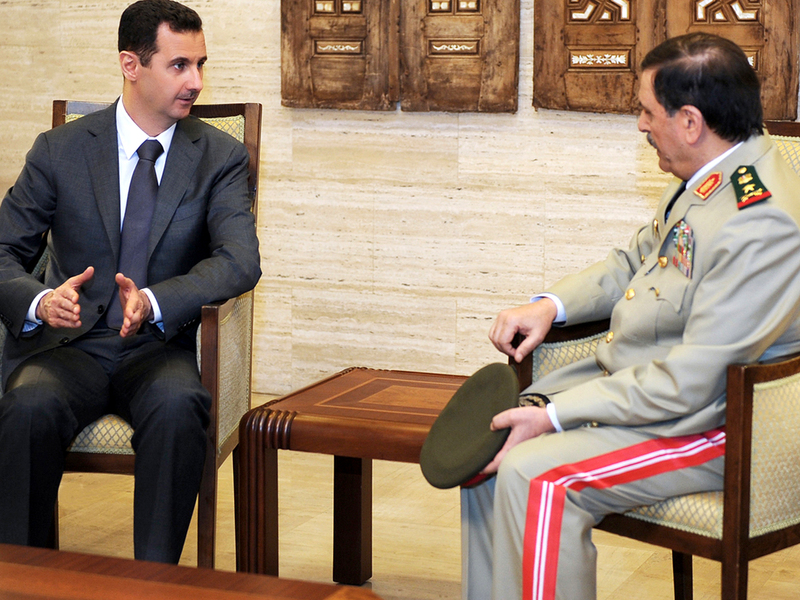 One thing is certain, Assad finds himself in an uncomfortable position, Ward reports. He no longer knows who he can trust, and the rebel Free Syrian Army is touting the deadly bomb attack as a major triumph, even calling it the beginning of the end for the Assad regime. Russia, China again veto Syria resolution in U.N. The state TV announcement appeared aimed at sending the message that Assad is alive and well. It said Assad, dressed in a blue suit and tie, wished the new defense minister good luck but it did not say where the swearing-in took place. Thousands of Syrians streamed across the Syrian border into Lebanon, fleeing as fighting in the capital entered its fifth straight day, witnesses said. Residents near the Masnaa crossing point  about 25 miles from Damascus  said hundreds of private cars as well as taxis and buses were ferrying people across. Wednesday's rebel bomb attack struck the harshest blow yet to Assad's regime. The White House said it showed Assad was "losing control" of Syria. Syrian TV confirmed the deaths of Defense Minister Dawoud Rajha, 65, a former army general and the most senior government official to be killed in the rebels' battle to oust Assad; Gen. Assef Shawkat, 62, the deputy defense minister who is married to Assad's elder sister, Bushra, and is one of the most feared figures in the inner circle; and Hassan Turkmani, 77, a former defense minister who died of his wounds in the hospital. Also wounded were Interior Minister Mohammed Shaar and Maj. Gen. Hisham Ikhtiar, who heads the National Security Department. State TV said both were in stable condition. Maj. Gen. Robert Mood, the Norwegian head of nearly 300 unarmed U.N. observers in Syria, condemned the violence and encouraged a diplomatic solution, which appears increasingly out of reach. "It pains me to say, but we are not on the track for peace in Syria," Mood said in Damascus. Hours later, China and Russia vetoed a new U.N. Security Council resolution on Syria's crisis  reflecting divisions between them and the West on who is responsible for Syria's crisis and how to stop it. The resolution would have imposed non-military sanctions against Assad's government if it didn't withdraw troops and heavy weapons from populated areas within 10 days. It was tied to Chapter 7 of the U.N. Charter, which could eventually allow the use of force to end the conflict. Russia and China have long opposed any moves that put the blame exclusively on Damascus or could pave the way for foreign military intervention in Syria. The 11-2 vote, with two abstentions, leaves in limbo the future of the 300-person U.N. monitoring team in Syria, whose mandate expires Friday. In the latest fighting in Damascus, government forces fired heavy machine guns and mortars in battles with rebels in a number of neighborhoods in the capital, the Britain-based activist group Syrian Observatory for Human Rights said. Adding to the confusion, Syria's state-run TV warned citizens that gunmen were disguising themselves in military uniforms to carry out attacks. "Gunmen are wearing Republican Guard uniforms in the neighborhoods of Tadamon, Midan, Qaa and Nahr Aisha, proving that they are planning attacks and crimes," SANA said. Many residents were fleeing Damascus' Mezzeh neighborhood after troops surrounded it and posted snipers on rooftops while exchanging gunfire with opposition forces. The Observatory, which relies on a network of activists inside Syria, said rebels damaged one helicopter and disabled three military vehicles. Rebels fired rocket-propelled grenades at a police station in the Jdeidet Artouz area, killing at least five officers, the group said. Activist claims could not be independently verified. The Syrian government bars most media from working independently in the country. The unarmed observers were authorized for 90 days to monitor a cease-fire and implementation of Kofi Annan's six-point peace plan, but the truce never took hold and the monitors have found themselves largely locked down because of the persistent violence. Mood said the observers "will become relevant when the political process takes off." Syria's 16-month crisis began with protests inspired by the Arab Spring wave of revolutions, but it has evolved into a civil war, with rebels fighting to topple Assad. Activists say more than 17,000 people have been killed since the uprising began in March 2011, most of them civilians. The Syrian government says more than 4,000 security officers have been killed. It does not given numbers of civilian dead.